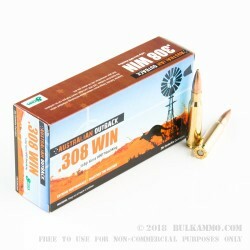 This 308 Win cartridge by Australian Defense Industries (ADI) features a 168 grain projectile accompanied by a host of features to optimize its performance. The MatchKing bullet made by Sierra offers great accuracy along with a high ballistic coefficient, traits that have earned it favor from many successful competitive shooters. Its boat tail not only prevents scratching during assembly, but also makes it resistant to cross winds, gives it a flatter trajectory, and increases its velocity. 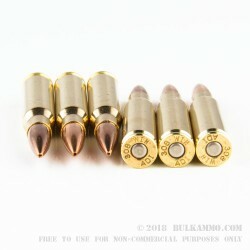 Finally, its hollow point ensures that it will mushroom after impact, maximizing damage potential for more successful hunting. 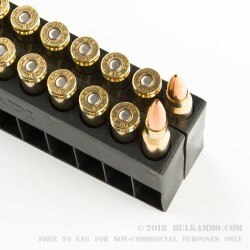 Combine all of this with ADI’s proprietary Ballistic Temperature Independence technology, which preserves the bullet’s trajectory even when fired in extremely hot or cold temperatures, and you’ve got a versatile round that’s certain to satisfy under any conditions. 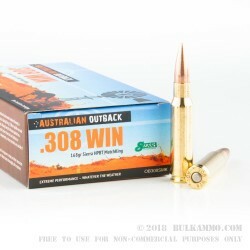 ADI was founded by the same man who opened Australia’s very first ammunition factory, and has supplied their country’s military and discerning hunters the world over for decades.